Your Inspiration for IIT: My elder sisters, both are medical students and they inspired me a lot for JEE. What Unique did you find in the study material of #Resonance: Sheets were very useful and practical. Exercises were given in a sequential order with increasing level of difficulty. As a result, I first mastered the fundamental concepts and then prepared my self in a better way for the tough questions. How did you make a balance between the studies at Resonance & at school simultaneously: I completely separated my school life and the time after school. I even used to sleep during the time I got between the two. While I was in the class in my school, I would listen to the teachers attentively. 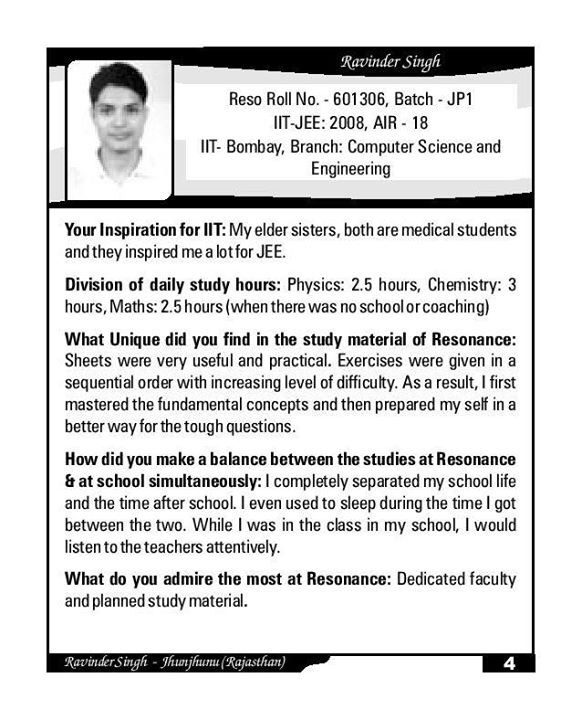 What do you admire the most at Resonance: Dedicated faculty and planned study material. Tips to increase productivity: I think the best way is to give your mind and body adequate rest. You will not be able to cope up with the preparation if you keep on worrying about your marks or rank. How did you plan the final revision of the whole syllabus of IIT- JEE in the last few days: Out of 13 available days, I reserved 11 days for complete revision. Each day I used to study all the three subjects according to the requirements. I practiced some tests and on the last day I did nothing except trying to calm myself. 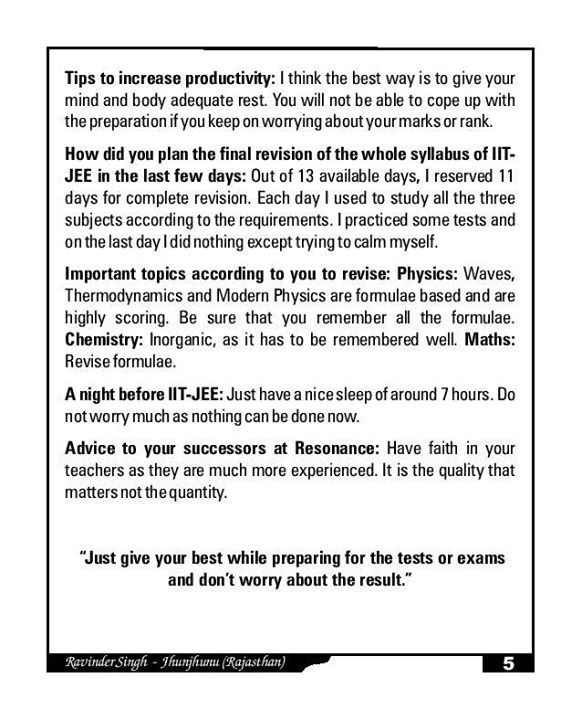 Important topics according to you to revise: Physics: Waves, Thermodynamics and Modern Physics are formulae based and are highly scoring. Be sure that you remember all the formulae. Chemistry: Inorganic, as it has to be remembered well. Maths: Revise formulae. A night before IIT-JEE: Just have a nice sleep of around 7 hours. Do not worry much as nothing can be done now. excellent process for crack jee exam !!! !